Please find below the answer to your questions. The Taxi Butler is a device that facilitates ordering a taxi from all venues (restaurants, bars, cafes, hospitals, offices, hotels, etc.) This product is designed for taxi companies and Taxi Apps. It is the best way for a taxi company to offer their clients an easy and fast way to order a taxi. To integrate with Taxi Butler please click here. Who are the customers of Taxi Butler? Our customers are taxi companies, taxi groups (taxi drivers that have one collective dispatch system) and taxi Apps. For who is the Taxi Butler a perfect tool? The Taxi Butler is specially made for taxi companies and dispatching software companies to offer an extra service to their customers (Hotels, Bars, Restaurants, Clubs, Offices, Hospitals etc..). Are there any limits on the number of live booking on each device? The limitation will be configurable from the portal so you can choose how many live bookings are allowed at a certain moment. How many booking can be displayed on the device at any point of time? At this point, the ONE device can display 7 booking at a time. If you order more simultanious trips you will see a little taxi icon and number in the bottom left corner which will show the total taxis ordered. The PRO device will show all trip in the screen. You can scroll up and down to view them all. Who pays for the Taxi Butler? Since the Taxi Butler brings in more rides for the taxi company, we recommend to our clients (taxi companies and Taxi Apps), to give the Taxi Butlers away free of charge to hotels, bars, restaurants, and businesses. How does it connect to my taxi company? We already have a website ordering tool, so why is the Taxi Butler better? Giving your customers a physical device will increase their loyalty to your taxi company and give the customer excellent ordering comfort. Do you provide roaming SIM cards? Which network provider? What are your technical support team working hours? The device will be usually maintained by your company. However, incase of any technical queries, you can always get in touch with our technical team on: tech@taxibutler.com. What do you suggest in terms of roll out of the units? Please find more information about placing Taxi Butlers on this page, where you will find tips and tricks: http://bit.ly/Placing-Taxi-Butlers. What is the cost of replacement in case if customer lose the unit? If it is vandalized or stolen or misused the replacement value is 200 pounds. 250 euros per device. All other reasons you get one replacement free of charge. Our experience is that they are rarely stolen or vandalized because there is no other use for them than to order taxis. And the devices can also be fixed to counter or wall for extra safety. Will the device give customers from and too location to the Taxi Driver? (Because certain taxi drivers choose their drop locations). The ONE device will only show the ‘from’ location to the Taxi Driver and not the ‘to’ location. Based on the “From” location the Taxi driver can decide if he would like to pick the customer up. The device is typically used for as soon as (ASAP) possible pickups. The PRO and KIOSK devices have an option to fill in the destination, time and more trip details. How does the postal address of each unit gets allocated to the hardware? How / who can change it if it gets moved? As a taxi company, you will get access to the Taxi Butler Management portal https://portal.taxibutler.com. (You can fill the address of the Taxi Butler location using the portal). We are a dispatching software company. How can we benefit from this product? Is there a maximum amount of Taxi Butlers to be in circa at any given time? Usually we have the devices in stock. If not, we can deliver them within a couple of weeks. Who maintains the device? If it breaks down what's the turnaround time to get the device back up and running? The device will be maintained by you and if it breaks down you will have spare devices at your office and you can replace them immediately. You will have an online portal where you can manage all your devices and can easily add a new device to a location (where the old one broke down). Does the device work in other languages other than English? Yes, they do work in other languages and they are already pre-programmed with 15 most common ones and there is an option too add any language of your preferences. Is there a manual for the Taxi Butler ONE? Yes, there is please download it here. Is there a minimum term or contract? We offer monthy and 2 year plans all-in. If we get a certain amount of Taxi Butler devices does the cost get reviewed? Yes, that is possible, if you take more than 500 we can discuss pricing. 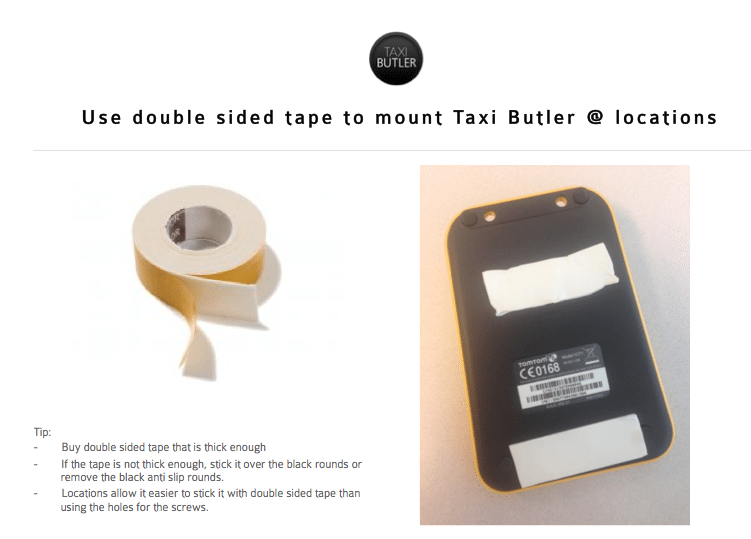 What is the minimum trial period to test the Taxi Butler device? The trial period is 2 weeks. Is the devicie on a 2G or 4G connection? Will the device work with any Data Management system? Yes! it is possible to integrate with any data management software. Here is what our API needs http://bit.ly/1nymaU1. The Data response can be changed as per your need. We mainly use (REST & SOAP). Do let us know which software provider you use currently. Please contact sales@taxibutler.com or your dispatch software provider for your pricing. Will Taxi Butler provide the car models on the screen for the customers to choose from? The Taxi Butler ONE has an option to order a normal verhicle or a BUS. Is the monthly cost exclusive of VAT? For EU customers, if you provide us with your local VAT number we will not charge VAT on the invoice. For non-EU customers we will not charge VAT on the invoice. What happens when the taxi has arrived the venue and the customer does not show up? The taxis are usually ordered by the receptionists, waiter or any other operator of the venue so, incase of customer’s unavailability, the operators will cancel the order. Is the Taxi Butler certified? Yes, the Taxi Butler is certified and built following the highest quality standards. Since the Taxi companies have to place the devices in different venues, there might be an issue of resource bandwidth. Hire – for instance, temporary workers on a part time basis, train them and assign them to the simple task of visiting venues to place the Taxi Butler in the locations you have chosen. It is recommendable that your team visits your customer/partner locations to place the devices this will keep you closer to those customers and earn their complete loyalty towards your company. How is Taxi Butler PRO different from Taxi Butler ONE? The Taxi Butler PRO is one step ahead of the Taxi Butler ONE. Taxi Butler PRO allows you to add customer phone number, customer destination, choose your vehicle type, pre-book a taxi etc. Is it possible to connect a particular Taxi Butler with a particular service type? For instance, when the order is created via a Taxi Butler located in a Hotel A, this order will go to the service type A and when the order is made through Taxi Butler located in a Hotel B, the order will go to the service type B. If you want hotel A to always order a standard taxi & hotel B to always order a 6-seater then you change to required settings in our portal. Also, it is possible to set the alternate service type to your device just by pressing the button on your device a little longer & it will give you the alternative choice. So you can book two different types from the same device and you can set it in the portal. Can I become a reseller of Taxi Butler? Please do contact us via our contact page for more info. Apps offer a similar service with an end to end solution for hailing and payment. There is no guaranteed pick up or payment? Correct, but that is similar to the phone service. From our experience, it is not a problem since the receptionist is ordering for the guests. They feel responsible for getting the right guests in the taxi. Is there an overview with e.g. softcopy of letters, brochures, images of the products etc.? Could you name several taxi companies that are currently using the Taxi Butler service? At the bottom of the www.taxibutler.com website, you can see several logos of taxi companies that use our service. You can always request contact details of the responsible people by sending us an email if you are looking for testimonials. We offer our service in more than 40 countries with the biggest taxicompanies as our customers. There needs to be a certain amount of customer education to be done in order to prompt usage. Our experience is different since the device is so simple, self-explanatory and operated by the receptionist, bartender etc. it normally is explained in 1 minute and within 2 weeks the venue reaches their maximum of orders per day (since the entire team gets the new concept in their venue). There is no passenger information, just a booking number. With Taxi Butler PRO and KIOSK the customer can add customer details optionally. Would work well in Hospitals and similar buildings. Agree, we see the best results (# of rides and happy people at the locations) in hospitals, nightclubs, hotels, and restaurants. Would work well in lower volume quality locations. From our experience, it works in all locations, from nightclubs (sometimes more than 50 rides a night) to small restaurants (4 rides a week) to hospitals 10 rides every day. We do recommend our clients to only put the device in locations that generate more than 4 rides a week to have a proper ROI. Would work well as a replacement of a free phone service. Yes and this dedicated device also gives more feedback. Where can I find the C / NO number on my taxi Butler? Can we upload for instance 100 locations at once to the Taxi Butler portal so that, we don't have to type it manually? Yes, this is possible; please send the Excel sheet to tech@taxibutler.com. Also, type some extra information and then we will post it online. What happens if devices get stolen at the venue? This happens very rarely. There have been no reports on stolen devices so far. In case such a situation arise then you shall receive a new device from us. In situations where the devices do get stolen then you can easily block the device on our online management dashboard so that no one can make an order with the stolen device anymore. The easiest way to secure the device would be to use thick double sided tape and mount it to the back of the device. Please refer to the reference image given below. Do we ship to USA and Canada? Do you have power adapter for North America ( 110 V) & is it included in the monthly cost? Yes, we do have power adapter suitable for North America ( 110 V) and it is all included in the monthly pricing.